Symptoms of Autism research papers show that scientists vary on their opinions but generally there are six main symptoms of autism. There are six symptoms, which usually indicate autism. Scientists vary in their opinions. Some believe all the symptoms must be present for a diagnosis of autism. Others do not believe all symptom have to be present. Which ever opinion is correct it is clear that the severity and the manifestation of the symptoms vary widely from child to child. The first symptom is "Failure to Develop Normal Socialization." This is usually the most obvious symptom of autism because many children with autism will simply not interact socially. Isolation, seemingly little or no emotions, and little attachment to others or the world around is common evidence of this symptom. The second symptom of autism is "Disturbances in Speech, Language, and Communication." Forty percent of the children with autism do not speak at all while others have "echolalia", which is a repeating of sounds just heard, or repetition much later. When an autistic child is able to talk, their voice will often be monotone or high and squeaky. Autism's third symptom is "Abnormal Relationships to Objects and Events." Over time autistic children can usually learn to tolerate change. At first though any disruption in routine no matter how small can put them through great turmoil. Play for an autistic child can also be strange by conventional standards or nonexistent. Symptom number four for autism is "Abnormal Responses to Sensory Stimulation." As people walk around each day they filter out thousands of extraneous bits of information in order to focus on what is important in the world around them. Autistic children though have trouble with this filtering process. 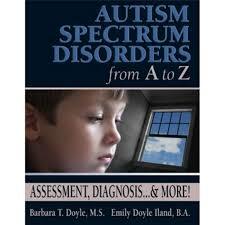 Light, colors, logos, shapes, and letters and words can mesmerize a child with autism and make them unable to function. Paper Masters writes custom research papers on Symptoms of Autism and show that scientists vary on their opinions but generally there are six main symptoms of autism.